My son is usually shy and rarely responds to a person he meets for the first time, but somehow Dr. Lisamade him really comfortable and it was great to see him responding to every single question Dr. Lisa asked him. :) She showed a friendly, kind and upbeat energy to us and I appreciated it. My son is usually shy and rarely responds to a person he meets for the first time, but somehow Dr. Lisa made him really comfortable and it was great to seehim responding to every single question Dr. Lisa asked him. :) She showed a friendly, kind and upbeat energy to us and I appreciated it. Dr. Lisa is a wonderful and caring Dr. We trust and respect her immensely. Best Dr. we have ever had. 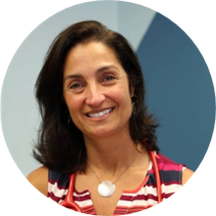 Dr. Lisa M. Fitzgibbons practices at Pentucket Medical Haverhill – Pediatrics and caters to the community of Haverhill, MA. A talented pediatrician, she earned her medical degree from the University of Massachusetts. She advanced her medical expertise by completing a residency at Baystate Medical Center. Certified by the American Board of Pediatrics, Dr. Fitzgibbons is a skilled and experienced provider. Her extensive knowledge base and exceptional clinical experience in pediatrics ensure that children receive the best quality care. Dr. Fitzgibbons enjoys following children through all the different stages of development as they grow into young adults and thrive. She makes sure that parents bring their children routinely so she can provide them with the immunizations they need to protect them against potentially life-threatening infections. She believes that it’s much better to provide growing children with the optimal care they need to prevent diseases from happening rather than waiting until a problem arises to treat it. It was a good visit, the people were very nice and helpful. Dr. Lisa is the best. She listens to my daughters concerns. I highly reccommend her. Very nice and good doctor. I enjoyed it a lot, I like Lisa she's easy to talk to.